Kathie Camara is a professional artist who has taken classes from many famous artists in order to develop her own style. She holds many certifications in different mediums and is always updating her skills to better teach her students. 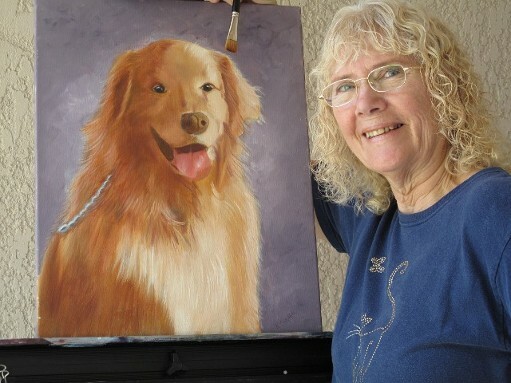 Although she no longer paints wall murals, she still takes commissions on portraits and pet portraits and teaches people to paint pets, portraits and seascapes in a series of 2-day workshops. When a painting turns out well, Kathie is elated. She knows that a piece has turned out well when someone looks at it and smiles because it has brought back to them a happy memory. Another of Kathie’s passions is warm glass. Several layers of cut glass are fused together at very high temperatures in a glass kiln to form beautiful Dichroic Pendants. The same glass is fused into larger sheets to ‘slump’ into vases, plates, coasters, candleholders and other decorative glass art. A design of yours can also be painted onto the glass to make the fused art truly one-of-a-kind. Kathie also encases photos of your family member, pet or a favorite automobile in glass pendants, making necklaces or key chains that are unique. Clermont, Florida (west of Orlando) is where she lives with her husband, Al, who is her greatest supporter. Together, they have four grown-up children, and five grandchildren, most living in New England. Kathie is a great grandmother, with two great grandaughters living in GA.
GRANTS/CERTIFICATIONS: Joyce Ortner International Seascape Certification 2014. Weber w/oils Certification with DewberryU 2013. Alexander Art Oil Instructor 2010-2012. Valerie Stewart Portrait Certification 2010. TEAM Certification 2008-2010, FL Dept. of State, Division of Cultural Affairs: Professional Development Grant - 2008, Onestroke: ELITE Certified Instructor-June 2006, Decorating Masters Institute Certified Faux Finisher & Instructor-March 2003, Donna Dewberry Wall & Furniture Specialist-May 2002, One Stroke Certified Instructor-June 2000.